Rochedale South is a northern residential suburb of Logan City Council, 19 km (12 miles) south of Brisbane CBD, Australia. It borders Rochedale, Eight Mile Plains, Priestdale, Springwood and Underwood. At the 2016 Australian Census the suburb recorded a population of 15,317. In the 2011 census, Rochedale South recorded a population of 14,996 people, 51.3% female and 48.7% male. The median age of the Rochedale South population was 35 years, 2 years below the national median of 37. 71.9% of people living in Rochedale South were born in Australia. The other top responses for country of birth were New Zealand 6.5%, England 4.3%, South Africa 1.1%, India 0.6%, Fiji 0.6%. 86.1% of people spoke only English at home; the next most common languages were 0.9% Cantonese, 0.9% Mandarin, 0.6% Arabic, 0.5% Hindi, 0.4% Greek. Rochedale South is 19 km from Brisbane City, or 15 minutes drive, 56 km or 35 minutes drive from Surfers Paradise in the Gold Coast and 28 km or 21 minutes drive from Brisbane Airport. Its Northern boundaries of Priestdale and Underwood Road form the Logan/Brisbane local council boundary. Part of the suburb's western boundary follows the Pacific Motorway. In the past Rochedale was known for its rich, red soil that is good for crops. Yet due to recent years of drought in the area, much of the farming has been abandoned and are now commercialised. In 1952, the Gill family ran a poultry farm and piggery and in 1967 developed the land into the first sewered estate in the region. They named some of the streets after the towns[where?] and streets in England from where they originated in 1951. Some of the streets were Ridgeway Street, Green Way, Edgeware Drive and Gills Close. In 1979, the suburb was split off from the larger Rochedale. The Strathlands shopping centre opened in 1970 but was later renamed Rochedale Shopping Village. A number of churches and school were established in the following decades as the population of the suburb expanded with estate developments. Nearby high schools include Springwood State High School, Rochedale State High School and Redeemer Lutheran College. Rochedale South State School, Springwood Road State School are within the suburb whereas Eight Mile Plains State School, St Peters Catholic Primary School and Rochedale State School are all marginally outside the suburb's boundary. Rochedale is home to the 2010 Brisbane Premier League champions, Rochedale Rovers Football Club. They play out of Underwood Park, Priestdale. ^ a b Australian Bureau of Statistics (27 June 2017). "Rochedale South (State Suburb)". 2016 Census QuickStats. Retrieved 29 March 2018. ^ Australian Bureau of Statistics (31 October 2012). "Rochedale South (State Suburb)". 2011 Census QuickStats. Retrieved 28 December 2013. 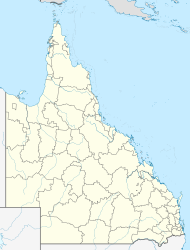 ^ Queensland Government Statistician's Office, Queensland Treasury. "Projected population (medium series), by statistical area level 2 (SA2), SA3 and SA4, Queensland, 2016 to 2041". www.qgso.qld.gov.au. Retrieved 2018-12-23. ^ a b "Rochedale South". Logan City Council. 1 May 2013. Retrieved 28 December 2013. This page was last edited on 23 December 2018, at 08:26 (UTC).